Britons heading to their local airport this Bank Holiday weekend have been encouraged to plan their journey in advance. That's because traffic levels are set to increase, while train disruption is also possible. According to the RAC, this could be the busiest Spring Bank Holiday weekend for traffic in four years, given the recent good weather conditions. Between today and Monday, it's thought that as many as 16.5 million leisure journeys could be taken across the road network - up 1.2 million on last year. Things could be particularly bad later today, with holiday traffic battling with commuter vehicles. This week's soaring temperatures are likely to encourage people to get away for the weekend, while many families will also be taking jaunts abroad. Transport disruption can strike during any part of a holiday, with the trip to the airport just one leg of the journey. Travel insurance can cover holidaymakers for cancelled or delayed flights, as well as things like medical costs. 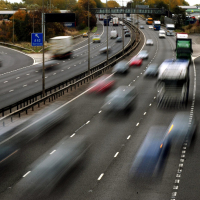 RAC traffic spokesman Rod Dennis said: "The late Easter has meant there's been something of a Bank Holiday bonanza this year, with up to four days off in the space of just six weeks. "But that's not stopping UK drivers from taking to the road for a leisure trip this coming weekend, especially as the weather at the start of the weekend at least is set to be dry, sunny and very warm for much of the country. "We're expecting leisure journeys to reach a peak on Bank Holiday Monday as families set off for a half term trip or take a day trip to the coast. But drivers should be warned that the roads are likely to see significant congestion on Friday as getaway traffic and everyday commuter traffic combines." According to transport information from Inrix, journeys covering certain stretches of the M25 and M5 on Friday could take up to four times longer than normal. On the rail network, those heading to airports could face route closures in the south east of England. Network Rail is still working on the rebuild of London Bridge station and the surrounding tracks.